I have an idea for the stealth ship. You see how the stemocyte turns into a photocyte for a brief moment before the photocyte turns into a bullet and into the stemocyte. 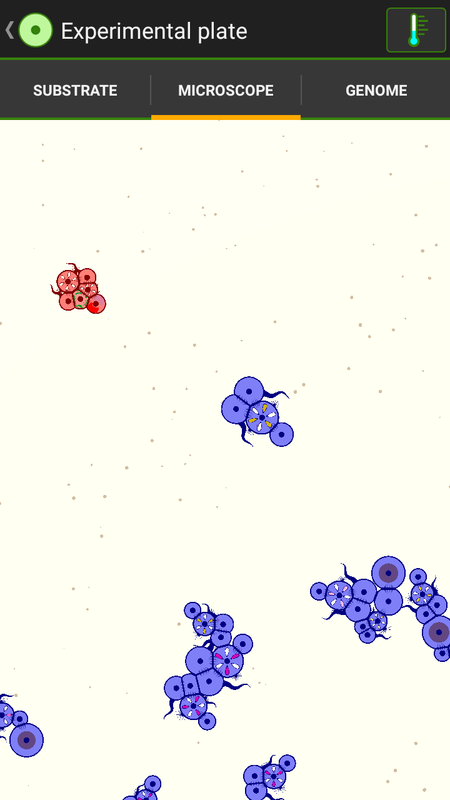 You can color the photocyte a detectable color to make the ship detectable for a brief moment, maybe that will help. Railgun is certainly possible in low viscos, however the ships could be destroyed by the substrate even before the bullet hits, so for that one I'm not too sure. ruffo wrote: I won! Muhahah die AI, die! I take the basic kite swimmer layout and added a few cells. I'm really confused when picking a right layout for this swimmer, so the modes are all over the place. I didnt manage to make it chase food , maybe another stereocyte and a phagocyte? The swimmer seeks blue, then the senseocyte will send out S2 signal to change the stemocyte into a cyano-secrocyte. Neurocyte brain can maybe be used to do a "nose dive" accelerating both flagellocyte to max. The swimmer then charges head first to the target, most of the time crushing its own head and the target's head, while delivering the cyanide poison. For the Emperor!!! Y'know how you said that cell splitting can neutralize cyanide? This gave me a new idea. - Has a stemocyte at the front that turns into glueocyte upon contact with allied ships. Once attached, the glueocyte transforms into a phagocyte that never stops splitting (and has a very low split ratio), therefore it drains out any cyanide the organism comes into contact with. I am currently working on this one right now, because MEDIC! Thats actually a really interesting idea!. My first taught was a swimmer that will detect it's own color change due to the cyanide poison and force the corresponding cell to split. (How to do this, I dont know , maybe a stemo-photocyte will give enough nutrient. My suggestion of Mitogens would be really helpful to use though). And I think the cyanide neutralization only happens on the cell that are splitting, example : M1 is hit by cyanide, it needs to split 4 times to neutralize the poison, other cells will still be affected if they dont split too. Also, high mass lipocyte takes somewhat longer time to die than normal cells, and cyanide need time travel each cells, I tried it on a string of lipocyte produced by photocyte, and the cyanide will never reach the photocyte. I think this can also be used as a strategy. Making the medic swimmer sensors might kinda hard to do . Do you have any ideas on your mind? If they track by color then they will waste alot of nutrient the swimmer its saving, maybe high color threshold?. It have a bunch of photocyte strings, the one in the middle I just administered some cyanide on the tip, you can put on incubate and see the photocytes will neutralize it. I dont know the exact number, but there is a specific ammount of cyanide to kill a cell, cyanide dont kill a cell in a single touch. There is also a specific amount of time for the cells to neutralize the cyanide, a longer matrix will do better rather than a closed matrix . I think it has to do with surface area, not just the number of cells it need to go through (so a "string" will be better than a "box"). I hope this helps developing you Medic Swimmer. The infected cell, the cyanide will be shared among their connection and they can survive. But if they touch the cyanide too long, they'll die before they can share it. Hmm. Yeah, that would be an interesting study. I just tried 4 Secrocytes on the end of a string vs 4 on the corner of a box. They killed one cell at the end of the string, and none in the box. If that's correct, the cyanide dissipates enough through two adhesins to become inert, but not enough through one to prevent the first cell from dying. Then I used a box of Lipocytes and a box of Photocytes: the latter being larger because the Photocytes kept growing to max mass. It looks like mass doesn't matter, which is a bit surprising at first glance. Not sure how that works exactly. Wow. The medic ship is a lot harder than I expected. This is just a prototype. In the creation of the medic, using inspiration (lipo barrier + split neutralization) I opted for a splitting lipocyte shell, which turned out to be way more complex than I expected. After some testing, the shell seems to be quite resistant to cyanide, however instead of fully neutralizing the cyanide, it somehow built up inside the internal swimmer. The shell has it's weakspots, such as the sensocyte-stemocyte head, and the photocyte tail, where cyanide resistence is basically zero. The shell is also completely useless against devoro bullets, as the devorocytes can easily crack the shell open. Just place 1 egg onto the substrate.